On Saturday, September 27, 2008, from 10 am - 5 pm The Phillips Collection in DC will host a Symposium titled Painting in the 21st Century. I find it curious that Blake Gopnik, a well-known acolyte for the "painting is dead" mafia is part of the panel(s). Of course, Gopnik's erudite words could be the Hannity to the Colmes of the panel's central idea. Details here. VCU graduate Claire Watkins, now living and working in NYC, made some brief appearances in the Greater DC area a few years ago on her way to NYC and all of her work was snapped by savvy collectors and her prices have skyrocketed since then and later this year will make her London solo debut. “The digestive system turns food into eyelashes. I am in awe of the minutiae and delicate actions that make up everyday life. The machines I build reflect this awe and wonder. And what enviable art creatures they are! Watkins has become a sculptural master of barely discernible movement and fluid energy. Not just the energy caused by the mystery of magnetism, but the new visual discoveries that happen when she marries her assemblies, installations and machines to the magnetic dance of the rotation of the planet as it travels through the Universe. This fascinating artist's work deliver iron filings that move and dance both to the rhythm of the magnetic poles as well as the flight of our planet through the cosmos; two unepected forces to find driving a piece of art. 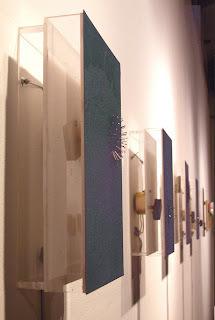 The effects of electricity have been curious since its discovery and capture, and electricity also has a powerful visual presence in Claire Watkins work, traveling through metal, lights, wires, motors, lights, microcontrollers and those fascinating city drawings that are today’s circuit boards. Electricity becomes a foundation for her art as she exposes its invisibility and dual citizenship in various incarnations. 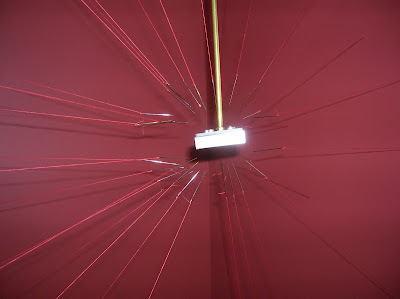 Electricity drives her rotating magnet as it in turn commands a harem of needles to dance to the tune of magnetism choreographed by the movement of the Earth. Electricity rearranges her iron filings as they torture us with their minute steps across the metal boards of her acid surfaces. Electricity lights up her filaments as she captures light to create sculpture from photons. The digestive system turns food into eyelashes and Claire Watkins turns hidden forces into visible art.